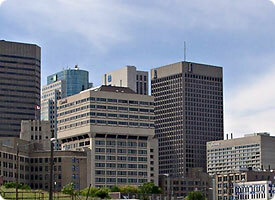 Winnipeg is the capital and largest city of the province of Manitoba. It is known as the "Gateway to the West' due to its critical location on the Canadian transportation network. The city is located near the geographic centre of North America, on a flood plain at the confluence of the Red and Assiniboine rivers, a point now commonly known as The Forks. It is protected by flooding by the Red River Floodway. It is by far Manitoba's largest city with a population of 619,544 (2001 Canadian census). The Winnipeg Metropolitan Area (which includes Winnipeg and surrounding rural municipalities), has a population of 711,000 (Statistics Canada, July 1, 2006 estimate), and is the ninth largest Census Metropolitan Area in Canada. Winnipeg offers an abundance of recreational opportunites as it lies in close proximity to hundreds of lakes including Lake Winnipeg, Canada's fifth largest lake and the world's eleventh largest, Lake Manitoba, and Lake of the Woods. The city is one of Canada's major cultural centres and is home to the world famous Royal Winnipeg Ballet. It boasts historic architecture, scenic waterways, numerous parks, and numerous distinctive neighbourhoods. Winnipeg hosted the Pan-American Games in 1967 and 1999, the only city other than Mexico City to have hosted the event twice. The University of Manitoba is the largest university of the province of Manitoba, most comprehensive and only research-intensive post-secondary educational institution. It was founded in 1877, making it Western Canadas first university.